“The Bear and the Nightingale” is one of those peculiar novels that feels ancient but is completely individual and new. Katherine Arden’s debut is a sweeping story of a Russian family trying to survive harsh winters in the 13th century. It is also the story of Vasya, a young girl with a fiery spirit that makes the men and women in her life uneasy. Vasya and her family live in the cruel wilderness of northern Russia and suffer 10 out of 12 months in cruel conditions. In the opening chapter, Vasya’s mother declares that her youngest daughter will be born with the gift of magic. Throughout her life, Vasya is faced with roadblocks that would prevent her from becoming the heroine she was born to be — her father resents her for taking away her mother on the birthing table, the adults in her life try to confine her to the kitchen, and her stepmother and priest invoke God while trying to tame her wild ways and outgoing personality. Arden takes us through Vasya’s most formative moments — but as much as the story focuses on Vasya and her growth and eventual heroism, it also layers a mythical war and political intrigue into the plot. Vasya’s father struggles to find good lives for his children, an ambitious priest incites fear into Vasya’s village to cleanse their souls and a campaign is waged to rid Russia of the Mongolians’ presence. In addition to the mundane conflicts in “The Bear and The Nightingale,” a secret war between the old gods is also being waged — directly affecting the lives of Vasya and her family. What begins as an ember in the first chapter erupts into an intense climax filled with fantastical creatures and ancient archetypes of good and evil. The many threads Arden uses to weave her talecould easily get tangled, but her writing is simplistic and descriptive, giving the feel of a children’s book — highly effective and incredibly entertaining. The ethereal tone of Arden’s storytelling serves her well in the more mystical parts of the book, and allows her to gloss over the complex social structures and politics of medieval Russian society. By blending elements of a classical fairy tale, literary drama and pure fantasy together, Arden is able to create a story told through the plot, characters and the setting. Arden’s tale is permeated by the bleak Russian landscape, creating an atmospheric bubble that captures you and holds you hostage as you read it. The dismal dark winters are portrayed vividly, but the lively summers are filled with oppressive heat and backbreaking labor — a nod to Vasya’s ties to the coldest season and her magic. Although Arden crafts a remarkably engrossing story, it lingers in places it shouldn’t. Arden spends most of Part I in Vasya’s childhood, a time when not many important plot points occur and too much contemplation is had. Parts II and III — Vasya’s adolescence and heroic trials — are where the most entertaining action happens, but Arden makes you wade through the boring exposition that fatigues you once you get to the more exciting parts. 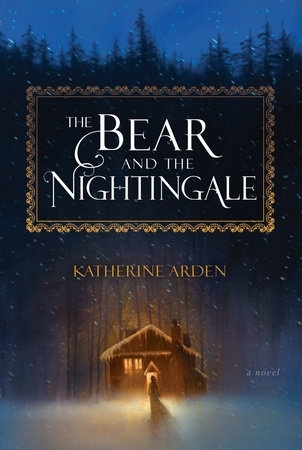 “The Bear and the Nightingale” is the first in an anticipated trilogy, so the tone of Arden’s next story might be drastically different from this book — a story that focuses on family while the fantasy is an added bonus. No matter what type of story you’re looking for — drama, fantasy, action or mystery — “The Bear and the Nightingale” will satisfy any need.